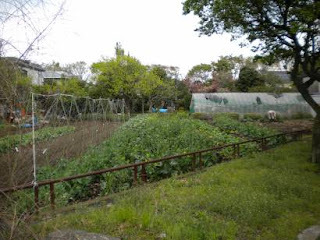 In my neck of Tokyo there are still a number of small farms and many sell their vegetables directly to the public. Usually, it's just a small table with the vegetables, a sign, and a money box. The stands are only manned on busy streets or bicycle paths. It's one of my all-time favorite ways to get locally grown vegetables. The price is competitive with the grocery store, and I put the money directly into the hands of the farmer. Not to mention the field where the carrot, broccoli, or daikon came from is visible from where I'm making the purchase. I figure with every yen I give the farmer it gives them a better chance of keeping that land open for production. The farm stand pictured here is one of my regular stops. It and its farm are on a bike path that runs north of our apartment building, and as the season change I watch the fields turn over and the vegetables rotate. This past winter on nicer days the farmer dried daikon on a rack in the back corner of the field - in long thin strips - that I recently purchased and will begin plopping in different dishes to see how they work. Here I can find any number of vegetables along with a variety of homemade pickles that are the bomb-diggity and make for adventurous eating. One change this past year was the addition of a vegetable box. Previously, it was only the wooden table with a roof and sides. Now, there is also a metal shed with the locker pictured above inside. A shutter pulls down at night to tuck it away. Lockers like this seem to becoming more popular in the area, although they must cost a pretty penny. I imagine it makes the stand that much more secure, although I don't believe there's been a recent wave of vegetable stand crime. However, it also means the customer can't easily compare bunches or closely analyze the pickles. 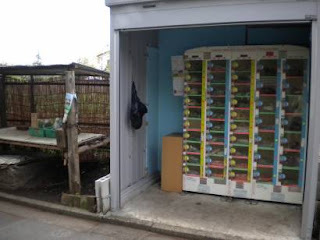 And it means that while everything is still just about 100 yen (making the prospect of filling both bicycle baskets nearly irresistible) the shopper MUST have a 100 yen coin on hand. 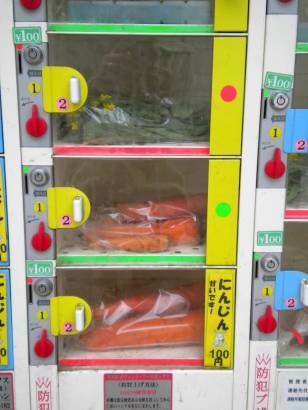 Pop in the coin, turn the handle, and get your vegetable of choice! I always lived inside the Yamanote-sen, so I never saw farm stands in Tokyo. This is interesting. We feel quite lucky, in a way, to live out in the burbs. We're considered Tokyo, but it's not the bustling buzz where you lived. Although, I'm always impressed at the amount of greenery I do see here throughout the city. Not just parks but the vast assortment of pots and containers surrounding homes, high up on balconies, or in front of a gas station. That's absolutely one of my favorite things about living here. Wow, that really is nifty, although I think I'd prefer to be able to really see the produce before I buy. Found you through the Blogathon, looking forward to reading more about your life in Japan. So fascinating! I love this idea. We have neighbors who leave piles of their extra zucchini out, but they're just looking to get rid of it, not make money. There is a local woman who does this with flowers, though. Oh my- what memories your post brought to my mind- the vending machines for everything I could ever think of. I used to live in Urayasu-shi (for seven years). Looking forward to reading more of your updates this blogathon! The stands are lovely, and in fact today while biking we saw a ton more. It's a real benefit of living closer to the edge of the city. Landguppy: Flowers? How lucky! One nearby stand sells those sometimes, and they're just the best summer bouquets ever. Wow! Thanks for your beautiful writing and lovely photos. Tokyo is my newest dream destination. Much enjoyment with the blogathon, I too am participating. Excited for more reading about Japan.